Helps for an ejoyable meal time. 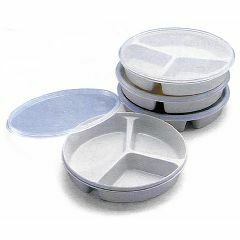 I ordered this product to help me prepare, store and serve my elderly father his meals. I was happy to see the lids were microwavable since not all covers on this type of dish are microwaveable. I like the dish itself and serve my purpose but after using the dish and lid a few times, the lids curled up and will not stay securely on the dish. It defeats the purpose of having this great dish but not being able to keep the lid on. I wouldn't recommend this item if you are intent on having a workable cover/lid. The overall size of the plate is approximately 8 1/2" with 1 section about 1/2 of plate & 2 smaller sections. My husband likes it! Is this in a one pack or are there multiple plates for that price? Is it microwaveable? This is one plate with 3 sections. It is microwaveable. I usually don't wash plastic covers in the dishwasher as they tend not to fit well after. We would recommend this plate to others.